Both inpatient and outpatient rehab can be useful to cope with addiction. What is most effective depends on your individual needs. Read more here. ARTICLE OVERVIEW: This article outlines main differences between inpatient and outpatient settings for alcohol rehab. Inpatient rehabs require around-the-clock residence. Treatment is provided in a secure facility where recovery is the main focus of all daily activities. These structured environments help people get out of negative environments. Inpatient treatment helps you build life skills in the least stressful surroundings. Outpatient rehab gives patients more freedom because they are free to go home after daily program ends. In an outpatient setting, you can continue to attend to your responsibilities to family, work, or education. Inpatient alcohol rehabilitation programs last at least 28 consecutive days, although some programs may last for a year. The duration of treatment in most cases depends on client’s needs and progress. An ideal treatment length is around 90 days, or so. Outpatient rehab programs last, on average, for about 10 weeks, even though they are open ended. Some programs offer treatment for 2 months to one year.Attendance ranges from a few hours per week up to 20 hours per week. Inpatient programs include full services. Another way to look at it is that inpatient programs offer a full menu of treatment options. This typically extends to detox, psychotherapy, and medication administration. The process of detoxification initially involves the assessment and treatment of acute withdrawal symptoms, which may range from mild like tremor and insomnia to severe, such as autonomic hyperactivity, seizures, and delirium. Sometimes, detox is absolutely necessary and requires 24-7 hospitalization. Outpatient rehab programs focus on talk therapy. Group counseling and one-on-one counseling for the basis of treatment. Because treatment tends to be step down in nature, the offerings in outpatient treatment may have less options than in inpatient rehab. Inpatient alcohol rehab offers access to therapy on daily basis. You’ll also have access to 24-7 medical detox services. In addition, you’ll be surrounded with people who are handling with the same problem as you. This will keep you out of the feeling of isolation. Another advantage of is inclusion of inpatient rehab is the inclusion of room and board. This way, you don’t need to prepare food or think about what will be on your menu for the next day. Inpatient treatment centers will prevent 24-7 supervision to restrict access to alcohol and provide a 100% alcohol-free environment. The primary disadvantage of inpatient alcohol rehab is its relatively higher cost compared with outpatient alternatives. Also, leaving your home and job can be kind of difficult, especially the limited daily visits of your family and friends. Outpatient rehabs are convenient when they are close to home and offer evening or weekend classes. You can continue to work or attend to home obligations without much interruption in your routine. They can also be less expensive than residential rehab. People who are alcohol dependent. People in adverse or disruptive family or job situations. People who are not able to travel daily to the treatment facility. People with associated medical conditions. People with severe or medically complicated alcohol withdrawal. Some of the disadvantages of outpatient rehabilitation is the increased risk of relapse which results from easy access to alcohol. 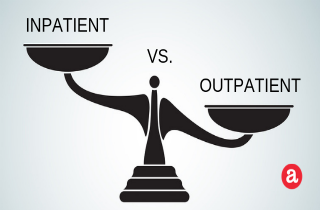 In addition, an outpatient setting requires a strong commitment to attendance. If you need a complete change of environment, an inpatient program might work for you. Ultimately, both treatment settings offer the same type of basic therapy. Talk therapy, also known as psychotherapy, is the cornerstone of any good treatment center. This typically includes individual or group therapy session. 12-step programs are also promoted in both inpatient and outpatient settings. The advantages and disadvantages of the rehab program will determine which setting is more appropriate for a particular person, but treatment setting itself does not appear to influence overall treatment outcome. Neither inpatient nor outpatient alcohol rehab can be defined as more effective. A number of questions remain unanswered concerning how to determine when a particular setting will be advantageous for a person. However, personal motivation and willingness to change are key indicators that influence treatment outcomes most. Being in doubt about which program will best fit your needs is expected. If you have any question, concern, or comment, please leave them in the section below. We’ll do our best to respond to your personally and promptly. Outpatient alcohol rehabilitation: What's included?